This morning I opened my browser to read the news online and found this headline: Obama Birth Certificate Released by the White House. My heart sunk. “Damnit . . . he gave in,” I thought to myself. I can understand why he would do it. After a while, I am sure that Obama and the White House were sick of all of the discussion of where he was born. This might be able to keep things focused on the issues rather than on Obama’s citizenship. Wrong. 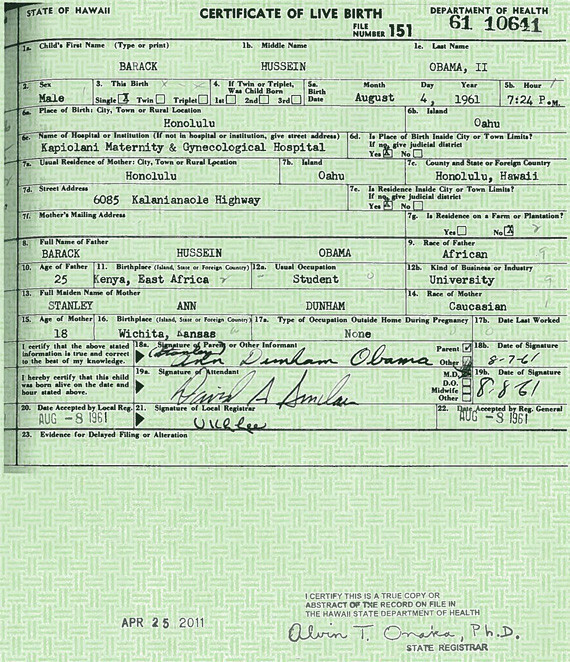 To help us understand this absurdity, we need to recognize that a majority of people in the United States have at least some doubt as to whether Obama was born in the United States. Only 38% of Americans completely believe Obama when he says that he was born in Hawaii to an American mother and Kenyan father. Most recently, this charge has been led by Donald Trump, corporate clown/potential Republican presidential candidate/reality TV star, but it is a charge that has been echoed by both the left and right since Obama announced his candidacy for president (after all, Hillary Clinton called for his birth certificate to be released as well). “Well, why didn’t he release it a long time ago? Why wasn’t he willing to be completely forthcoming?” I’ve heard those questions a thousand times, and I’ve been hearing them in all of the political chatter today. Well, I don’t know Obama’s motivations, but I didn’t want him to release his birth certificate. I didn’t want him to because the calls for him to do so are based in nothing but blatant racism. Daniel, a friend and ally in social justice work around the Denver area, emailed me in March, asking me if I would like to participate in the 2011 Lafayette Cesar Chavez Celebration. There were lots of ways to join in the celebration, but particularly, he asked me and my friend Zach if we would like to join in a 46 Day Community Fast where individual fasters would refrain from eating for 1-3 days while reflecting on and recommitting themselves to their social justice activism, then passing the fast to the next activist in line. Now, I’ve done some fasting in the past, but usually that has been a sun-up to sun-down, single day fast as part of my own centering process or as a way to stand in solidarity with my Muslim brothers and sisters during Ramadan. I’ve never fasted longer than a day, though, and I was pretty intimidated by the undertaking. Zach and I decided to fast together as a way to support each other through a two-day fast. On Tuesday morning my shift in the fast was to begin, so I awoke before the sun rose and ate a hearty breakfast, knowing that I would not eat again until sundown of the following day, 38 hours later. Now, I did consume some water, sometimes with honey and lemon (something done by both Chavez and Gandhi in their respective fasts), as I would likely need a bit of water to keep functioning throughout the days. Even with the water and its supplements, though, the fasting experience kept me present, kept me reflecting every time I had a pang of hunger. Wow! A lot has happened since I posted my “Tim Wise and White Privilege” entry last week! I was pretty excited to go to the White Privilege Conference, as I was one of the features presenters at the event, and I was looking forward to going to some great workshops and hearing some great keynotes. Little did I know, but I was about to have my world rocked. I was once told by an incredible professor and mentor that if I ever find myself quite comfortable, it is time to look around because growth never comes in a space of comfort. We only change and grow when we are challenged, and to truly be challenged is to be pushed to the boundaries if not outside outside of our comfort zone. Well, I was definitely challenged in ways that made me profoundly uncomfortable during the conference, and while that is tough, I am so happy and better for it. That being said, I still have a lot of processing to do, so my posts in the next week will likely be a part of that processing. What better way to process than to throw some of those ideas out to my readers to see what you all think!? As a result, this week’s post is meant to give you an idea of some of the things that were discussed at the conference (and I was only able to attend a minority of all of the things offered) while providing me a space to think through all of the amazing and challenging things presented throughout the White Privilege Conference experience. The following list is likely to be somewhat “stream of consciousness.” Each bullet relates to others and also very much stands as its own point. These are some of the conclusions and questions that I am struggling with. Please comment on any that challenge you! Agree, disagree, challenge! Discuss! This week I am so excited and honored to be speaking at and attending the White Privilege Conference in Minneapolis, MN. As a result, the concept of “white privilege” is very much on my mind, and I have been thinking over a few of my past posts about white privilege and privilege in general. If you haven’t yet checked them out, I would love to hear your thoughts! However, I know that in the midst of the week’s work, I will not have time to post a unique article of my own (but I definitely will post with some reflections on the conference next week). Thus, I have decided to highlight one of my favorite authors and an important voice in anti-racism work and in highlighting the role that white privilege plays in our society: Tim Wise. I encourage you to check out the video below where he talks about the ways that white privilege was constructed to only give the average white person a perceived or relative leg-up over people of color but actually hurts everyone in the long run. I also encourage you to check out his article entitled “With Friends Like These, Who Needs Glenn Beck? Racism and White Privilege on the Liberal-Left.” It was originally published here, but I have reposted it below. I find this article particularly important to consider for someone like myself, as I surround myself with very “liberal” people and often find myself pointing the finger elsewhere when it comes to racism and white privilege. His words rang out with an unmistakable certitude. “This is the most racist place I’ve ever lived,” said the man sitting across from me, a black writer and poet whose acquaintance I had only made earlier that day. His expression made it clear that this was no mere hyperbole spat out so as to get a reaction. He meant every word and proceeded in about twenty minutes to lay out the case for why indeed this place where we were talking — San Francisco — was far more racist, in his estimation than any of several places he had lived in the South. San Francisco. Yes, that San Francisco. From police harassment to profiling to housing discrimination to a persistent invisibility he’d felt since first arriving, there was no doubt that the ostensibly liberal enclave was head and shoulders above the rest. Our culture is great at denial. Well, let me clarify. By “our culture,” I am referring to the dominant White, Christian Patriarchy that has controlled the values and direction of the culture in which we live since its inception. Maybe, as Derrick Jensen offers in his stirring book The Culture of Make Believe, it’s more that we live in a culture where we must make believe that all is well, that tremendous atrocities have not been committed and are not being committed with blood on our hands . . . we have to pretend to be able to sleep at night. The unfortunate reality, though, is that the land that we occupy today is bloodied land. The Native American population of the United States was estimated, by some accounts and measures, to be nearly 20 million, yet today there are approximately 2.5 million left. This is no accident. This is by the direct actions of the U.S. government and its people through direct violent extermination and through unintentional and intentional spread of disease.